How Are We Supposed To Do That?!? I was sitting in a meeting today finding out for the first time some of the almost-final-but-some-details-not-quite-ironed-out ideas for what we’re doing for our Christmas service this year. Since we don’t do a Christmas Eve. service, our Christmas service is traditionally the Sunday before Christmas. This year that would be Sunday, December 19 which is now less than two weeks away. It struck me while I was sitting in the meeting that this is maybe the least stressful time of the year for me. I know that’s not the case for most folks in my position, but the whole Christmas service thing just doesn’t stress me out like it used to, and this kind of stuff used to seriously get me stressed. Now it’s almost liberating. Sure, I know we’re going to do something special that’s probably going to push our capabilities a bit. It’s a given. Every year. Rock and roll. It happens. Recall last year we had that whole multi-campus thing…. Today, in fact, I was practically out of inputs and definitely tight but in reality most likely out of monitor mixes the minute the first person opened their mouth. It happens every year. It’s clockwork. I saw it coming 12 months ago. Every year we figure it out. Maybe this is part of the whole 20-years-of-playing-with-audio-consoles thing this year, but looking back I can’t really remember a time when we didn’t figure it out. And that’s another part of the thing: WE. I think it’s very easy for myself and most audio guys I know to really feel alone and isolated in a lot of the challenges that hit during big production seasons like Christmas. But then I remember I’m not alone. In fact, looking back over the years I can’t really remember one time when I was actually absolutely alone. Even when I wasn’t surrounded by a couple of other audio staff guys and big team of audio volunteers, there was still always someone else I could talk to, dump on, and/or get ideas from. These days with the whole interweb and things like Twitter, Facebook, CTAN, and CTDRT, it’s almost more work to try and operate in a vacuum. And something else to remember is that we doesn’t have to equal “we audio guys” or “we production guys“. It’s amazing some of the ideas and you can sometimes get after talking to non-audio folks because they are natural out-of-the-box thinkers when it comes to audio. They might not have an actual solution, but they might help you think about the challenges a little differently so that you can solve them. Of course in the end remember that we are audio folk, and as audio folk we are naturally puzzle solvers. That’s the gig every week. We take a jigsaw of noises, tones, instruments, and sounds that sometimes have no business being together and MAKE THEM FIT. Christmas is for many church audio folk the biggest puzzle of the year to solve. So ENJOY it. Lean in, baby! Revel in the challenge. The fam is waiting on the other side. Granted sometimes there really are things that you just can’t do, and you have to have calm and rational discussions in those cases. But be cool. Still, if you’ve got a 32 channel console staring at 34 or even 40 inputs, bring it! You can probably get away without that hi-hat mic this, most people don’t really need stereo keyboards, y-cables and adapters are a fun construction project waiting to happen, and besides, haven’t you always wanted to re-patch on the fly? We can and will do it. That’s excellent advice, Dave. Especially the part about talking with non-audio folks. 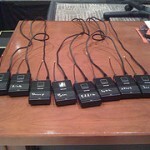 Last week, as I was struggling to figure out how to get all 17 of our wireless headsets at the same volume for the band in their ears (I had them on 2 different pre-fade auxes that were mixed to a single channel in their M-48s), the bass player said, “Hey, how about you run it so your fader controls our volume and if they’re the same in the house, they’ll be the same in our ears.” He meant “post-fader auxes” but didn’t know he meant that. It was a spark of brilliance; I quickly reset one of the mixes to be post fade, set all the actors at 0 and mixed away. Never had another complaint or request from the band the rest of the week. Like you say, we figure it out; it’s what we do.